This distinctive textbook aims to introduce readers to the basic structures of the mechanics of deformable bodies, with a special emphasis on the description of the elastic behavior of simple materials and structures composed by elastic beams. The authors take a deductive rather than inductive approach and start from a few first, foundational principles. A wide selection of exercises, many with hints and solutions, are provided throughout and organized in a way that will allow readers to form a link between abstract mathematical concepts and real-world applications. The text begins with the definition of bodies and deformations, keeping the kinematics of rigid bodies as a special case; the authors also distinguish between material and spatial metrics, defining each one in the pertinent space. Subsequent chapters cover observers and classes of possible changes; forces, torques, and related balances, which are derived from the invariance under classical changes in observers of the power of the external actions over a body, rather than postulated a priori; constitutive structures; variational principles in linear elasticity; the de Saint-Venant problem; yield criteria and a discussion of their role in the representation of material behavior; and an overview of some bifurcation phenomena, focusing on the Euler rod. An appendix on tensor algebra and tensor calculus is included for readers who need a brief refresher on these topics. 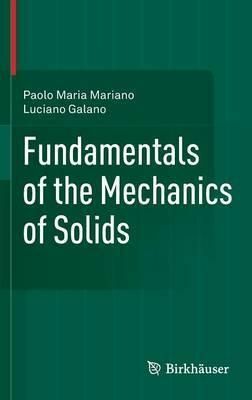 Fundamentals of the Mechanics of Solids is primarily intended for graduate and advanced undergraduate students in various fields of engineering and applied mathematics. Prerequisites include basic courses in calculus, mathematical analysis, and classical mechanics.